Our last blog discussed providing dynamic movement at the pelvis. If the pelvis moves posteriorly, the trunk will move posteriorly as well. So if posterior movement of the trunk is desired, dynamic seating components which allow posterior movement of the pelvis are provided, namely a dynamic back rest, which opens the seat to back angle in response to client movement and force. This movement may be utilized to protect back mounting hardware, absorb extensor forces and simply to provide active movement. If the client experiences a loss of trunk position upon return to upright, it is important to ensure that adequate lateral and anterior trunk support is used. Opening the seat to back angle can lead to shear forces between the client’s trunk and the back of the seating system. One result of this shear is that the client may move in relationship to the back of the seating system, affecting the relative position of supports attached to the back, such as lateral trunk supports. Typically the amount of movement is not significant and so the client is not significantly out of alignment with these supports, but if the movement is greater, the lateral supports could end up in the client’s armpits during extension. 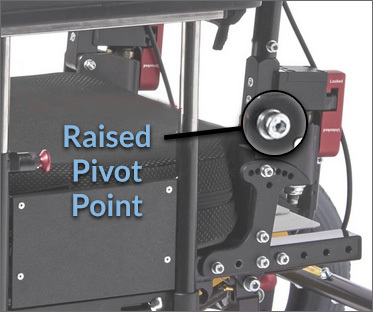 It is important to consider the pivot point of the dynamic back rest. Just as the optimal pivot point facilitates the pelvis returning to neutral after extending, the optimal pivot point also reduces shear in the back. Excellent comment Sharon! This is exactly why I prefer a higher pivot point on a dynamic back. This helps to maintain the pelvis in position and allow extension at that lumbar area. Movement is great, but the angle of that movement can help prevent loss of position.